Gertie's New Blog for Better Sewing: Announcing My Australia Trip! Damn, I will be in Melbourne a week later and nothing in Adelaide. Sew disappointed but thank you for making the trip and imparting your knowledge Gretchen. For all those who will miss out is there any chance the classes could be videoed and posted in YouTube later after editing? Thank you and safe travels.Audrey. Hi Gretchen I'm so excited about this course I've tried to register for your sew along in Melbourne in Bayswater for two myself Jane Hartley and my daughter Emilie Robinson, but when I go to send tge email it tells me that it's an invalid email address. I would love some in on cost and what we need to bring. Thank you so much for including Australia in your busy schedule. I may come to the Thread Den thing it sounds fun! If you want a night out in Melbourne, I'm sure a crew could be rustled up to show you the sights - we've got some pretty excellento cocktail bars and there's nothing better than intimidating the locals when you're all gussied up and moving in a pack! I am a local btw and I like intimidating other locals ha! Any excuse to wear a fancy hat and vintage stockings. Send me a message if you're not booked out the wazoo! Oh and it's World Class Cocktail Week while you are here! I've just booked my ticket for the meet & greet at The Thread Den, since it's around the corner from me! I'm so excited to meet you Gertie!! I've been an avid follower since you were still an editor in New York, and started sewing up the Vogue's New Look book!! No Adelaide......?? Sniff....sniff....sniff......... full blown wail and sob! Omigosh! 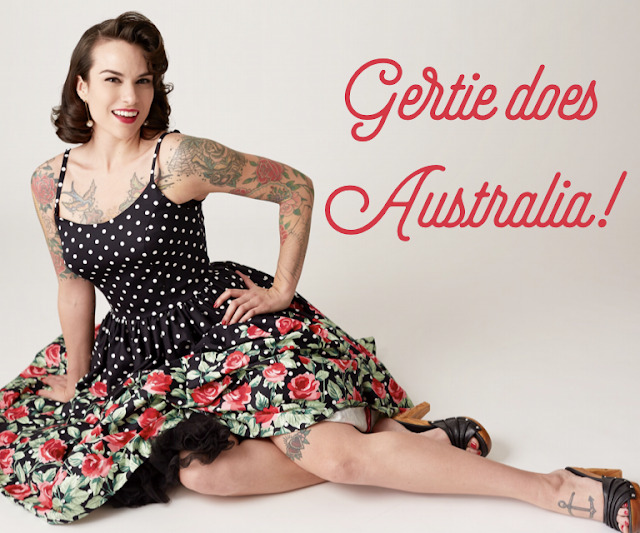 So sad that I can't get to any of those venues, but absolutely squeeing with excitement to learn that your fabric line will be available here in Australia! Hope you have a fantastic time while you are here.